Posted prominently on the fabric bulletin board above my desk is the phrase: "Never be afraid to try something new." It serves as a reminder to always seek adventure and new opportunities. In terms of marriage, it evokes images of Nick and Nora Charles as they go wherever the leads take them with cocktails in hand and a quick quip to lighten any misstep. In their eyes, the risk of adventure is worth the humor and affection it brings. And along the way, they catch a crook or two. Cathy - Opens window. Sneezes. Passes shirt collar through the door. No word spoken. Picks up newspaper from doorstep. Places on table. Robert - Comes out of bedroom. Changes date on calendar. Adjusts the time on the mantle clock. At breakfast table - Lifelessly stare at each other. No word spoken. Reality of marriage. No glamor girls or Hollywood hunks here, folks. Robert's exit to the office foretells of his departure to the war. Both are without ceremony. He taps the face of the wall clock. Like Pavlov's bell, the taps signal Cathy to hang an umbrella on Robert's elbow. There is no kiss goodbye, nor is there one when he leaves for the navy. Cathy's cold gets in the way each time--although Robert does not look terribly excited about the prospect anyways. The release from marriage allows each to go through a significant transformation. He toughens up. She gains confidence and loses her perpetual cold. Years are shed from their visages. Through a series of cleverly linked sequences, the screenwriters (Clemence Dane and Anthony Pelissier) show Cathy's and Robert's metamorphoses. In one scene, Cathy overcomes fear to deliver an important message. 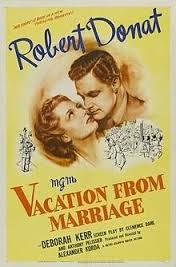 In the next, Robert describes his wife as simple, quiet, and dependable and then he in turn faces a traumatic event when his ship is torpedoed. This is followed by a scene in which Cathy describes Robert in a similar manner (simple, kind, dependable), adding his distaste for dancing. Soon after Robert is shown dancing--and enjoying it. Some might say Cathy and Robert have become new people as a result of the war. This may be true to a certain extent. He dances now, and she drinks pink gin. However, their transformation is more a rediscovery of their premarital identities. 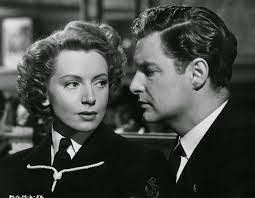 For example, Cathy, who no longer wore lipstick or smoked because Robert did not like it, begins to do both again--with a little encouragement from her bunk buddy (Glynis Johns)--upon entry to the Wrens (WRNS - Women's Royal Naval Service). Further evidence that the two have returned to their old selves by the end of the film is Cathy's comment after encountering the "new" Robert: "Meeting him like that reminded me of when we used to meet in the tea shop." Somewhere along the line, Cathy and Robert lost their individual identities. Once they recapture the essence of whom they once were, their marriage has a chance. The message that comes across and remains most relevant to twenty-first century viewers, though, is the importance of not losing one's identity and not becoming complacent in a relationship. Change it up every once in awhile--go to a different place for vacation, partake in your partner's favorite activity (dancing! ), or try a new drink. And if all else fails, take some tips from Nick and Nora Charles. 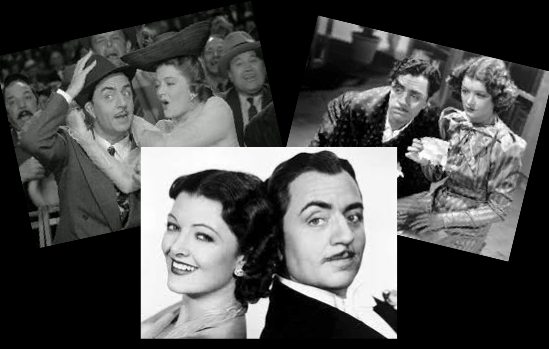 check out Thoughts on The Thin Man (now available via Amazon).